In September of 1915, the war in Europe was over a year old. The combatants had long ago determined that the war was not going to be brought to a quick conclusion. The British Fleet successfully blockaded Germany and her allies while the German U-Boat war was fully implemented with devastating effects to shipping in the Atlantic. The British were stubborn in adopting a system of convoys and the plucky little German U boats were taking a serious toll. Despite the willful determination of many in high places to stay neutral in the war that had spread across Europe and the world, America was still dependent on international trade. The sinking of the Lusitania in May was a harbinger of things to come in an unfriendly sea. Since even before the first shot had begun, American Naval leaders had been sounding the alarm bells about not being prepared for any war. The glorious days of Theodore Roosevelt had been replaced by years of austerity and limited growth. There was a strong peace movement within the country that felt like entering the war was just a perpetuation of the many wars Europe had fought for centuries. But the summer of 1915 brought with it doubt. Enough doubt that all aspects of defending the country were under review. President Wilson was still publicly saying that he would keep us out of war. But he also had assembled some of the best minds of the day to examine the situation. One of those was Henry Ford. 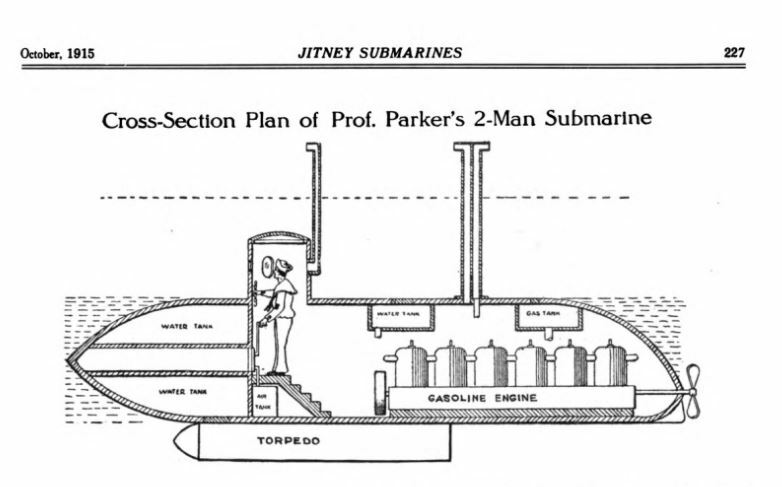 Mr. Ford had been toying with an idea of a smaller gasoline powered submarine that was small in nature and strictly defensive. In the fall of 1915, he and others floated the idea of a fast submersible powered by petrol. 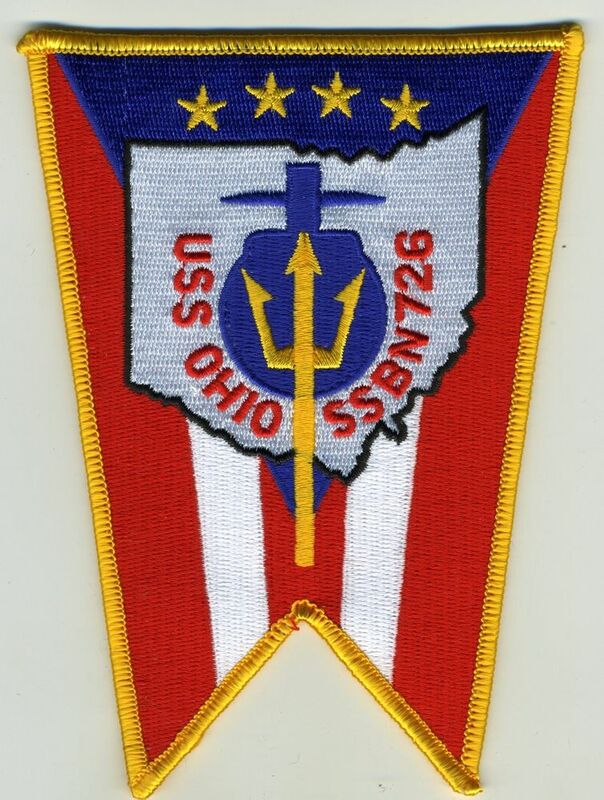 Veteran submariners must have balked at taking a large step backwards. 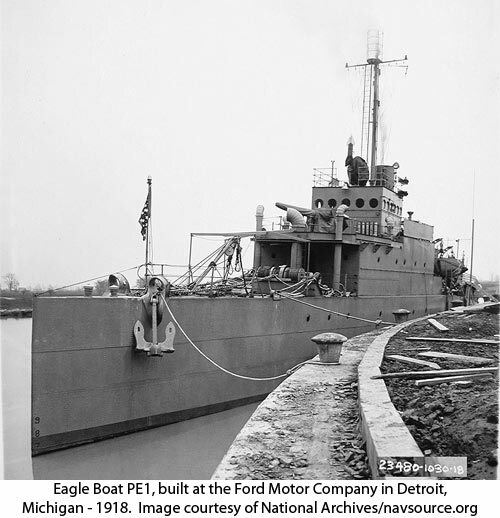 But the Navy is run by the civilians and when it was announced that Henry Ford would be making an inspection trip to look at some of the recent boats, they just followed the orders of their chain of command. Inventor Sees Undersea Craft for First Time. Shakes Head Over Cost After Inspecting K-5 and E-2 at Navy Yard Docks. Henry Ford, who proposes to revolutionize submarine warfare, had his first experience board a submarine yesterday. He visited two of the submersible craft of the United States navy at the New York yard, in anticipation of turning out one of his own invention. 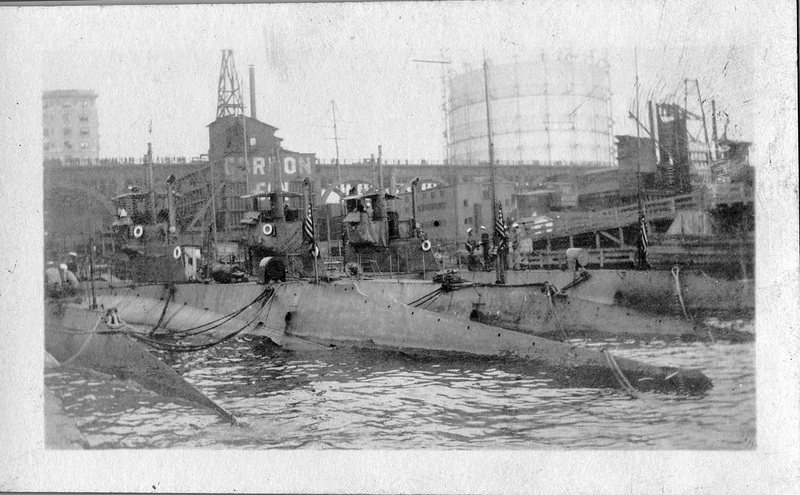 No fewer than ten tout hawsers held each of the submarines to the wharf while the automobile man made his inspection. It had been rumored that he would be taken for an underwater trip about the harbor, but none of the sailors made a motion to release the craft. Fresh from a conference with Secretary Daniels and President Wilson, he came to New York from Washington Wednesday evening. “Has your inspection of a submarine for the first time given you new ideas that will lead to a revolution in their construction or from which you will evolve a new type?” someone inquired. Although he is a member of the President’s advisory board of naval defence, Mr. Ford is nevertheless a pacifist. “I would like to abolish their manufacture,” was his answer. Considering his recent statement that a small type of submarine operated by a gasolene engine and manned by one or two men was the logical undersea defence of the future, Mr. Ford yesterday hardly seemed enthusiastic. 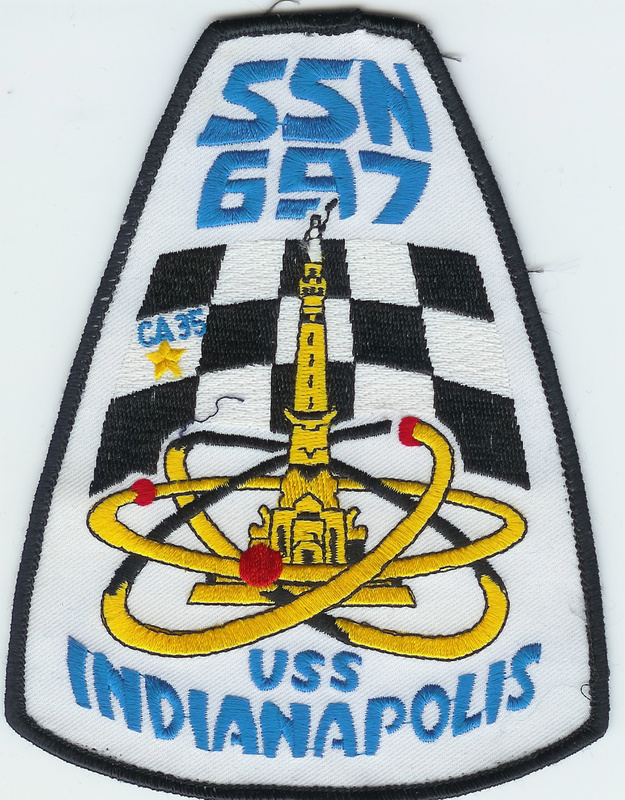 He admitted that he picked up some new ideas – he never went anywhere without doing that, he declared and that he might submit them to the naval advisory board for what they were worth. Mr. Ford arrived at the navy yard shortly after 11 o’clock. He was accompanied by his son, Edsal and Gaston Plantiff, manager of his plant at Long Island City. Lieutenant Ralph Craft, aid to Rear Admiral Usher, Commandant of the yard, met him and introduced him to Lieutenant Commander Karl P. Jessup, chief of the machinery division. Lieutenant Jessup took the visitors to one of the plants where a diesel engine, the largest in this country, was assembled. The huge motor, which will drive a now submarine, was set in motion. In response to a question, Mr. Ford said that automobile engines in which heavy fuel oil was burned would undoubtedly be manufactured. The party was joined by Captain George E. Burd, industrial manager of the yard; Commander George H. Rock, Chief construction officer; Lieutenant C. W. Nimitz, in charge of submarine construction at the New York navy yard and Lieutenant R.C. Grady, commander of the submarine K-5. 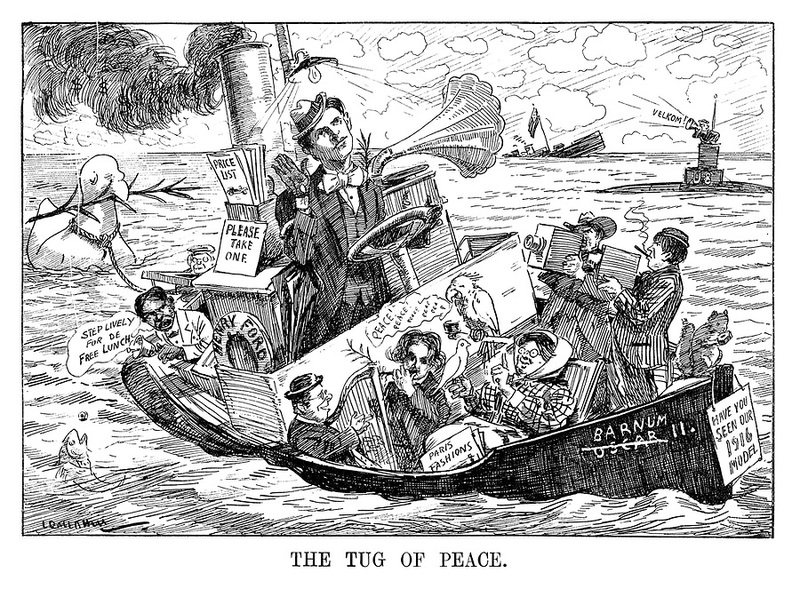 Mr. Ford elected to visit the latter vessel at once. Later he went inside the E-2. Miller Reese Hutchinson, right-hand man to Thomas A. Edison and Walter Miller, another of the Orange inventor’s staff, were also at the yard, greeted Mr Ford. Then Elmer A. Sperry, another member of the advisory board, came along, and he and the automobile manufacturer went to luncheon at the Hamilton Club in Brooklyn. Before leaving the navy yard the inventor spoke of the futility of war at the evils of war parties which dominated Europe in 1914. “I will do anything I can for the President or for Secretary Daniels.” He added. 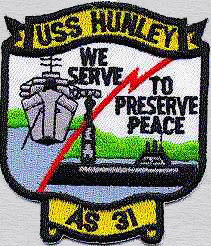 “If we have to have a navy, believe we should have the best, most efficient and up-to-date of them all. He declared that the war would probably last a year longer, until the industrial classes revolted. He denied that he had offered $10,000,000 for peace, but said that he would use whatever means he possessed to bring it about. Also, he was emphatic in denouncing the proposed loan to the Allies. “If any of the banks where I have money on deposit have any part in such a loan I shall draw my money out,” he said. After visiting the laboratories and factory of Mr. Sperry, Mr. Ford returned to the Hotel Biltmore. New York, Sept. 24.Henry Ford of Detroit was in New York yesterday to take a trip in one of the submarines at the New York Navy yard in furtherance of his promised attempt to perfect a gasoline motor for use in such craft. Mr. Ford said that he did not intend to be submerged in a submarine, but intended to look them over. Secretary Daniels had authorized the commandant of the navy yard to place a submarine at Mr. Ford’s disposal for the day. Navy submarines do not now use gasoline power, but are propelled by oil engines when on the surface and by electric batteries when submerged. Professor Herschel C. Parker, of mountain-climbing fame, and Mr. Henry Ford seem to be having a little difference of opinion as to which one deserves the credit for the miniature submarine of which a sketch, reproduced from the “New York Times,” is presented above. Had Professor Parker not set forth in such detail the various particulars of this boat, we would have been unwilling to flatly deny that something of this sort might not be done, but when he proposes, though it be only as an outline sketch, to construct anything of the sort here illustrated, it is really hard to take him seriously. His outline description of his craft as given in the “New York Times” of September 24, should commend itself to one of the comic journals. Unfortunately we must expect to get a good deal of this sort of thing from inventors, both voluntary and authorized, suddenly transferred to new and unfamiliar fields. Mr. John Hays Hammond, Jr., in the fallowing letter from the “New York Times” of September 25, ably points out the fallacies that surround the Parker-Ford idea. New York, Sept. 24, 1915. In these days where the lesson of the European war is being taken to heart by the intelligent and thinking American, it is natural that many suggestions for the improvement of our national defense should be brought to the attention of the public. It is, however, necessary that for the public interest the chaff be separated from the wheat, so that an intelligent understanding be obtained by the general reader of what should and should not be done. I have been working for the last four years on the problem of producing a high-speed type of submarine boat of the minimum possible displacement to achieve the purposes which I have in view. This boat resembles very much what Henry Ford and Professor Parker have been discussing lately in the press. In the research which I have carried on along this line I have had the very best advice from the leading engineers on the question of submarine architecture in this country. 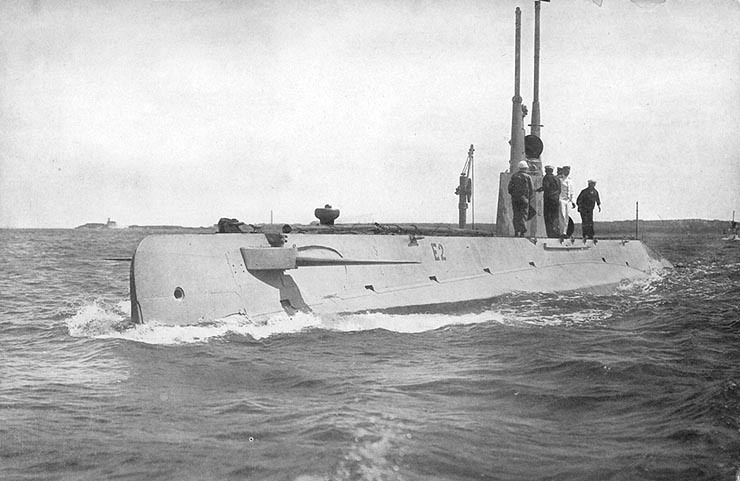 For any man to make the statement that under present conditions it would be possible to drive a submarine at the rate of forty miles an hour, and to, moreover, drive a submarine at this rate whose displacement is such that it would be capable of carrying several men, torpedo tubes, torpedoes, and the necessary equipment to enable it to function as it should, is, as far as I can see, nonsense. From the earliest days of development of the submarine boat attempts have been made to produce a small type of submersible craft under the control of one or two men and to handle these craft from the decks of battleships. The able French inventor, Goubet, spent his life to develop a satisfactory portable submarine. His work ended in final disappointment and failure, although through it a great deal of valuable information was contributed to the art. The whole tendency in submarine development has been toward the enlargement of the submarine, its increase in power, displacement, and length. A good deal of the fallacy in the small submarine idea is due to the fact that people imagine that because a torpedo can accomplish certain things it is possible for a submarine, or man-carrying torpedo-carrying device, to accomplish the same results. This whole illusion can be quickly dispelled by taking a vessel of the type, shape, and displacement of the torpedo and increasing it to a size which would enable it to carry several men and one or more torpedoes. On investigation it will be found that, in order to drive such a craft at the speed of the torpedo, a power would be necessary which would be out of all proportion to the carrying capacity of the craft. The torpedo achieves its results in having an ideal form of power plant for its work. With air pressure at two thousand pounds per square inch as a driving medium it is possible to cut down the engine to very small proportions. The range, however, is limited. The only other type of suitable prime mover that we have which can give us great power for a minimum of weight and size is the internal combustion engine. The internal combustion engine is almost as sensitive as a human being with regard to the question of having plenty of fresh air to operate with. The more powerful the engine the greater amount of air necessary per minute to enable it to run. It is incredible what amount of air is consumed in the explosions of an ordinary automobile engine, but it can easily be seen that this fact is true when one remembers that each time there is an explosion it is chiefly air that fills the cylinders of the gas engine and that the more cylinders the engine has and the greater number of revolutions that it makes, the greater the amount of necessary air is consumed in its operation. I do not consider that the question of getting rid of the exhaust gases would be nearly as difficult as the question of supplying the machine air when running submerged. It must be remembered that if the submarine were supplied with tanks under pressure to give this necessary amount of air there again it is necessary to increase its carrying capacity, its size, and to multiply by a tremendous amount the power plant to drive it at the necessary speed. Thus the problem is very much like that of a dog chasing its own tail, and at this point it may be said that for the optimistic inventor only ignorance is bliss. Outside of these general problems, on account of the uncertainty of torpedo fire, it is essential that more than one torpedo be carried, and these torpedoes cannot be diminished in size beyond a certain point, inasmuch as they must carry sufficient high explosive to achieve a definite destructive effect on striking the target. Then there comes the all-important question of the necessity of the submarine maintaining what is known as an even depth line, that is, that it shall travel at a constant and practically unvarying depth below the surface, otherwise it becomes a dangerous proposition to control. It has been noticed that the shorter submarines are more prone to erratic diving movements than those of great length. If a short vessel were traveling at the tremendous speed of forty miles an hour any sudden dive would carry it immediately to a depth at which the pressure of the water would be sufficient to crush in the sides. This is a point brought out in the work of no less an authority than Commander Sueter of the British service. The inventor will again probably pooh-pooh this idea by suggesting that the hydrostatic depth regulator used in the torpedo be applied to the submarine. Any one familiar with the way in which torpedoes go clam digging, for no apparent reason, in the bottoms of harbors would be loath to risk his life on the dependability of such mechanisms. On the whole, it is only necessary to acquaint one’s self with the development of the submarine art and to go into the actual cold figures relating to power and submerged propulsion to see that the small submarine of high speed is a fallacy. While it is very commendable that there should be a nation wide contribution of thought to the question of national defense, it is nevertheless to my mind nothing but lost motion to advocate the impracticable. It should be understood that the adequate defense of our country can only be brought about by a national movement to back the recommendations of the army and navy experts in Washington. The great question of training officers and men to fill the thin ranks of our army and navy is of vital importance. The construction of material which present conditions of war have shown to be absolutely necessary is a matter that should be undertaken at once. The inventive ability of our citizens should be encouraged and monopolized by our Government; but while this is so, the people must remember that preparedness is a national movement, and that the genius of one man and the effectiveness of one weapon does not constitute more than an element in the great barrier of defense that will protect our home and country. What of Henry Ford’s Submarine Idea? Henry never built a single one. He actually made a lot of money in the War that he opposed so much in 1915 by being one of the principle builders of the Eagle Boats, a fast moving submarine hunting surface ship (among other things he sold at a great profit). His empire would continue to grow well into the next war. Teddy Roosevelt once said that because Henry Ford was a genius at auto production, most people believed he was an authority on everything, which was a mistake. He was a complex person who was capable of inventiveness and persistence, but also of great hatred and mean spiritedness. Most importantly, once he left his immediate world, Henry Ford was often spectacularly, though proudly, ignorant. I wonder what Lieutenant (later Admiral) Chester Nimitz had to say about Ford the day after Pearl Harbor.